OH WOW this is awesome! I love your design and that little bow of baker's twine is just perfect!! Thanks so much for joining in the fun at our Double D ‘What’s On The Menu’ challenge! Good Luck and we hope you’ll come back often. Beautiful texture. 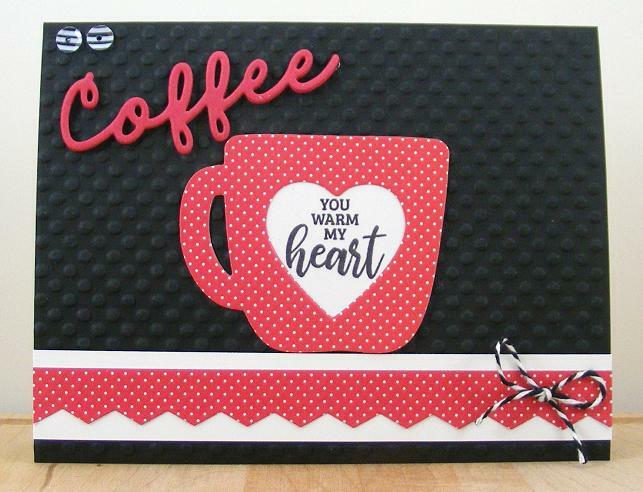 Love the pink and white polka dots and the coffee die cut. mmmmmmm Thanks so much for playing along with us at The Double D, It's On The Menu Challenge, Donna, DT Member. Fab card! Lovely colours and texture. Thanks for joining us at Little Red Wagon. Such a beautiful card! Love the red and black color combo - it has such a warm and happy feel to it. Thanks for sharing with us at Double "D" Celebration Challenge. Fabulous card Beverly! I love the texture from the embossed background and the polka paper is just perfect with it.